Frank Herrera & Jorge & Javier Herrera cordially invite you to attend Waffles, Wings & Walker, March 9th from 6:30-9:30 p.m. @ the home of Frank Herrera, 105 Blackhawk Trail in Hill County Village. An evening of witty conversation, winsome friends & wonderful food catered by Absolutely Everything Catering & Chef Jerry Olivarri. Fundraiser to elect Sam Talamantez Constable Pct. 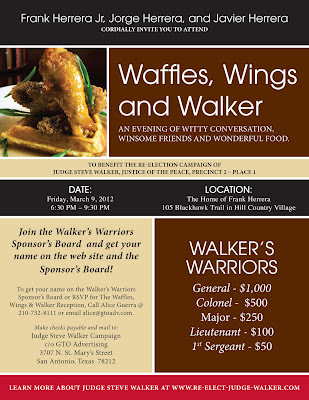 2, March 11th @ Pueblo Hall, 3315 Northwest Drive from 5 p.m.-10:30 p.m. $20 per person. For more info: 815-8755. State Rep. candidate & former Councilwoman Delicia Herrera fundraiser drew friends & supporters, to Los Barrios Mexican Cuisine on Blanco Road, February 29th. Priscilla Camacho, Lanny Sinkin, Dan Pozza, George L. Salinas, Jr.
Monday, April 2nd @ 6:30 p.m. @ the home of Mikal & Tammy Watts @ the Watts’ Gym, 14 Duxbury Park. Paid for by the Doggett for U.S. Congress Committee, P.O. Box 5843, Austin, TX 78763, Jim Cousar, Treasurer. Political contributions are not tax deductible for IRS purposes. You are invited to the Meet and Greet Day at the Zarzamora Street Gym ! 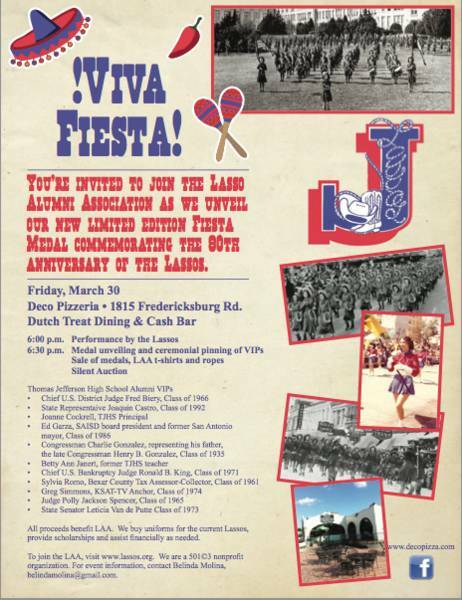 The LULAC Concilio Zapatista 4383 and LULAC Concilio de Justicia y Ley are proud sponsors and hope to see you there ! Yes, there will be Food, Music, and Refreshments. and at 1 p.m. presentation of special guests. The event starts at 11 a.m. and ends at 3 p.m. Saturday, March 3rd, 1402 N. Zarzamora. Bring your family and friends ! 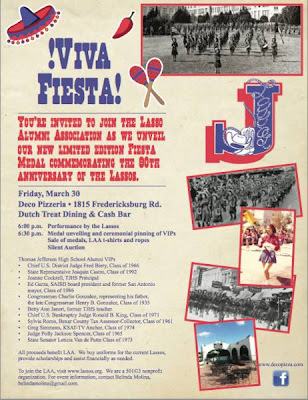 Lasso Alumni Association celebrates new Fiesta medal honring 90 years, March 30th @Deco Pizzeria, 1815 Fredericksburg Road @ 5:30 p.m. The West San Antonio Chamber of Commerce's 2012 Health Fair, will be held at Our Lady of the Lake University on Saturday, March 3rd from 9 a.m.-2 p.m. Free Admission. attendance to help provide free services and raise community awareness. Admission to this event is free to the public and the following services will be available: Flu vaccinations, bone density screenings, blood glucose testing, cholesterol testing, mammogram pre-screening, CPR training, fitness activities and educational seminars. We hope to see all of you at Our Lady of the Lake to help us promote and encourage a more healthy San Antonio! Note: Those attending for blood glucose testing, be sure to fast in the morning. L-R: DJ Tommy Calvert, Judge Genie Wright, William B. Johnson, Dr. Darren McClaren, former Councilwoman Lourdes Galvan, former Congressman Ciro Rodriguez, Rhett Smith, Kim Sanders, attendees, KROV 91-7 HD2 FM. KROV 91-7 FM celebrated its one year anniversary, February 27th on West Ave.